In the Essen 2011 no ship math trade, I was faced with the decision of how many copies of my own game I should enter. I have a rather large supply and can get more easily, and I could have put five or ten entries in for those - but I didn't want to clog that list. But seeing that some other designers also put their games into the math trade, it gave me an idea. How about a place where designers could agree on swapping their own games with other designers? Some of us do this anyway, but usually only with those others we personally know. Here's an attempt to help increase the number of trades that can be made. I have decided not to turn this into a math trade just yet, as I also want to reach those who are reluctant to enter a math trade. For future conventions, such as Nürnberg, Göttingen or next year's Essen, we can discuss the best way to do this - if there is any interest at all. Make an entry for each of your games you are willing to trade for other games. As this is intended for trading your personal copies of games, the games should be new and in shrink (or just out of shrink and signed), unless stated otherwise. Please also include version information if there are different versions, and also state the days you will be in Essen. If you want to, you can also include information on how many copies you are willing to trade or the kind of games you are interested in. If you see another game you would like, contact the designer directly by geekmail and suggest a trade. Agreeing on a meeting point and time in Essen is up to you, of course. - It is, of course, perfectly ok to turn down any offer. Please don't be insulted if someone turns down yours. 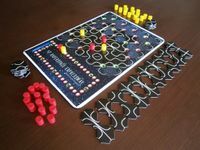 There can be all kinds of reasons: Your game might be great, but not attractive to the other designer's gaming group, there can be a limited supply of games that designer has, etc. I hope this can be a friendly experience. - It is, of course, also ok to offer older games this way, although the latest releases might find most interest. - It would be great if you posted some kind of numbers eventually, stating how many times you traded a particular game. This would help evaluate the success of this trade idea. - If you are a publisher rather than a designer, I guess it is ok to participate as well. Please state this explicitly, though, as some people might be after signed copies. - Please spread the word, even if you are not interested yourself. I am sure you know other designers who will be in Essen, don't you? Ideas for future improvements of this are more than welcome. Thanks! This is a small card game, so nearly no other game is too small to offer. - should play in under an hour. I also welcome games that are suitable for German teaching to adults (as that is my day job). Other offers are more than welcome, but I might (just might) turn them down. Of course, you might combine this offer with offers of my other games, if you want to offer something larger. I will be in Essen from Wednesday around 1 pm to Sunday night. Most of that time, I will be working at the Amigo booth. If you want to trade with me, we can work out the details. Pyra-Tern edition, as shown in the picture. English or German rules, whichever you prefer. If you want this for teaching math, I can point you to some resources to download (German and Danish only, so far). 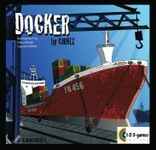 Docker edition from Jactalea/1-2-3-games. The game arrived a little bit after the fair last year, so this year it will definitely be available! For 3-6 players, English and German rules included. I will be at Spiel Wednesday-Saturday. Where, exactly, I don't know, but I'm sure we can work something out. A family game (age 6 and up), with multi-lingual rules. 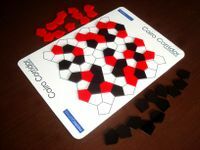 A 2 player game, with English and German rules included. English rules only, for 2-4 players. 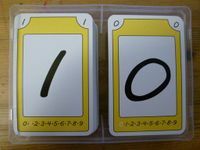 German rules are available on BGG, but there is some text on the cards and components. I'll be there again. I have a new game coming out from R&R, but not sure if I will have personal copies by then, Let me know if you are interested in Penguins or Plunder. A memory game where (in the basic version) you only have to remember 3 cards at a time. But this is more difficult then it sounds, because the information you have to remember changes every turn. I´ll be in Essen from Friday until Sunday. A non-diconnection abstract strategy game. A sci-fi abstract strategy game about waste disposals with an unorthodox scoring system and some reminiscences to The Hitchhiker's Guide to the Galaxy. A tile-placement game about closing rings. Game is language independent with the rulebook and survival guides in English. Both of these reading materials are available on BGG in German and Latvian. I'll be at the exhibit all 4 days - all of the time. I'll be going there with Brain Games and I will be at their booth (H1-G139) some of the time - more details on that later. Id consider any trade offer, but mostly I am interested in games with somewhat adventurous feel and a nicely fit theme. I will be at Essen Wednesday to Saturday. Not sure if I'm doing this correct but I'm offering copies of DuCo, a simple to learn pattern matching game where you place square cards and match up colors and shapes to score points. I have 2 versions of the game for trade. 1. Prototype print (50 copies or so left). Plastic wrapped without box. Manual available on special cards in English. Slightly old rules but new rules can be viewed online and apply perfectly fine for this version of the game. 2. Retail print (nearly unlimited supply). Includes box like the image above and with a 40 page manual in 9 languages. All wrapped in plastic or signed box should it be preferred. I will pretty much trade for anything as I see it as a fun way to distribute my game at the same time as getting some new and fun games from smaller developers. How does the rest of this work? Do people write here if they are interested in DuCo? Spielspass, german game with german rules. This is a simple family game for 2-4 players. 8 years up. Rules are in german only but the english rules are available here at BGG. The game itself is almost language independent (just some words). The game can be played by just looking at the pictures. The game itself plays in about 45 minutes. I´ll be at Spiel from Thursday until Sunday. 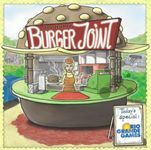 An strategic party game for 4-6 players. The objective of Cook-off! is to be the best and more productive chef in the contest. Its a game with Action Programming and Simultaneous Action. It plays in a really short time and is a great filler! I'll be in Essen from Thursday till Sunday. German Rules, Dutch available. This version of the game is not in sale, because it was a prize for a math contest. In case of interest I might also trade same of my other games.